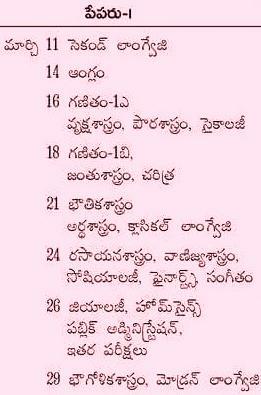 Andra Pradesh Board of Intermediate Examination (BIE) may be Conduct from 11-03-2016 to 30-03-2016 intermediate board exam time table. Inter 1st year ( Previous ) Exam start from 11-03-2015 to 29-03-2016 and 2nd year ( Senior Inter ) Exam start from 12-03-2016 to 30 -03-2016 . Above dates Inter board Proposed to AP Government , After Govt. finalize examinations schedule release BIE. All the Principals of junior colleges and composite colleges offering Intermediate Course in the State are informed that the Tentative Annual Academic Programme (Calendar) for the academic year 2014 – 2015 in respect of Junior and Composite Colleges in the State offering Intermediate course in general and vocational courses is as follows. 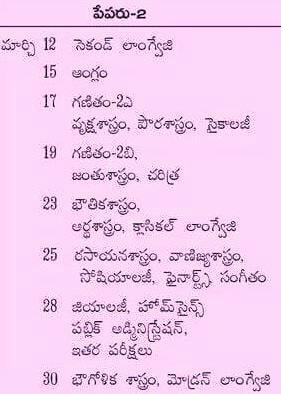 Pre-final examinations – I: 24-01-2015 (Saturday) To 31-01-2015 (Saturday) Classes should be conducted to the students who have shortage of attendance, before and after examinations on the above days. Pre-final examinations – II 2nd week of February 2015 Classes should be conducted to the students who have shortage of attendance, before and after examinations on the above days. Date of commencement of practical exams 2015 1st week of February 2015 Classes should be conducted to the students who have shortage of attendance, during February 2015.